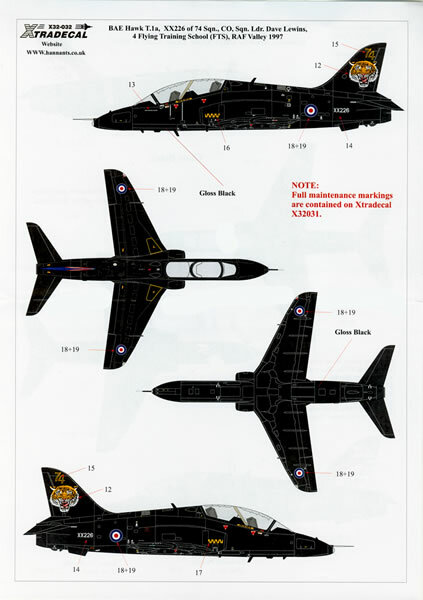 The BAe Hawk is a small but colourful machine and the markings contained on this sheet will allow you to replicate two of the distinct schemes it wore in 1/32 scale. 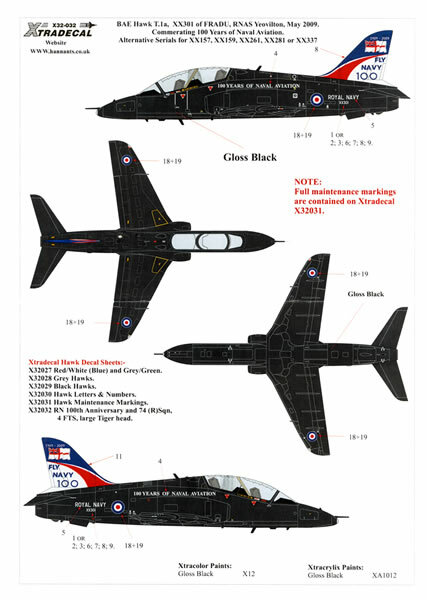 Xtradecal have been quick off the mark in releasing five new sheets in 1/32 scale for the new Revell BAe Hawk kit. This sheet provides markings to replicate two of the “special” schemes that have been applied to overall glossy black finished machines. XX226 74 Squadron, of 4 Flying Training School RAF Valley, Anglesey in the United Kingdom, flown by the School’s Commanding Officer Squadron Leader Dave Lewins in 1997. Its markings comprise a large tiger head and a stylised yellow outline ‘74’ on the vertical stabiliser/rudder and the squadron’s yellow and black markings on the sides of the intake. XX301 of the Fleet Requirements Air Direction Unit (FRADU) Royal Naval Air Station (RNAS) Yeovilton at Somerset United Kingdom from May 2009 Commemorating 100 Years of Naval Aviation. 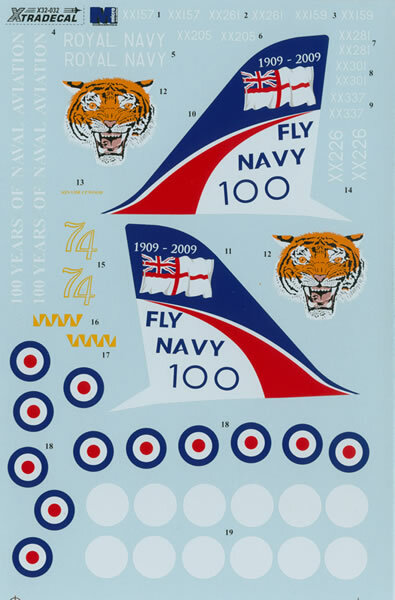 The markings comprise a brightly painted red, white and blue vertical stabiliser/rudder with a fluttering ensign, and the logo “FLY NAVY 100 1909 - 2009” which is supplied as a one-piece decal for either side. The words “100 YEARS OF NAVAL AVIATION” in white lettering are also worn on both sides of the fuselage. You also get a choice of serials to replicate a further of five airframes that wore the scheme, XX157, XX159, XX261, XX281, or XX337. The decals themselves are printed by Microscale Industries. They are all in perfect register, thinly printed and have an absolute minimum of carrier film surrounding each design. Apart from the previously mentioned decals, you get 12 roundels on the sheet with a further 12 white discs to apply underneath as the thin white outlines to the roundels. Other decals include a pair of ROYAL NAVY scripts. You are on your own for the seemingly myriad stencil data and maintenance instructions that adorn the Hawk’s airframe. However, Xtradecal offer these on a separate sheet (X32031). The placement guide is an A-4 sized sheet that shows four-view diagrams of each option in colour. The placement guide and the decals are packed in a paper envelope with a clear “window” front which does not bode well if you rely on the postal system for your modelling supplies as it would not last five minutes if it was thrust into a leaky mailbox on a rainy day!